Well (to Quote MYSELF), “It’s (jest) a big shell game; the only conclusion you can draw is we’re losing it on purpose”. Cut ’em Off at The BILL$, InDeed! Bruce- we need chaos in the world to keep our MICC (add Congressional to Ike’s warning) prosperous. I wish it weren’t so but America may go down as one of the most vicious and immoral empires in history so far. Time for US to like Ike, agin’ ! Meanwhile, Shades of 1942 emerge in the land of the free and the home of the …ahem..brave. now..please excuse me while I try to keep my stomach from upchucking. Personally I would suspect any theory about a group of brainwashed fanatics being able to extract, produce and export oil by themselves. After all, the author of this blog already explained (with reference to a wonderful conversation with one “oil man”) that only big oil corporations have the required technology and expertise. The part in one of the links about Isis operating oil refineries I wont even bother with. But the oil does keep on flowing, doesn’t it…? 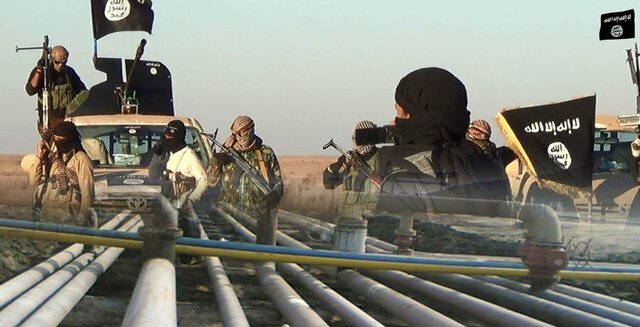 in huge quantities from the north/kurdistan where pipelines old and new exist, and smaller quantities through long truck convoys from other “isis controlled” areas. So it must be a profitable business even with a barrel as low as $40 on the end of the chain. To cut a long story short, my view is whoever is taking that oil is not paying the royalty fees to the host nation because there aren’t any nations left to claim what is supposed to be the biggest chunk in the price of any oil barrel. So how convenient that all of a sudden, just when the Iraqi parliament was approving the energy and resources legal framework, several rogue armies in the region prevent the former countries to get their part of oil revenues. I wonder if we know any industrial-military-complex that could benefit from such a perfect setup…? You get cheap oil, leave a tip to the armies on the ground, which they use to buy arms from you to keep the mayhem going, and a little air support from drones to make sure no one jeopardizes the juice.